Aubergine (French), Eggplant (English) is finally making its appearance in our gardens and farmers markets. 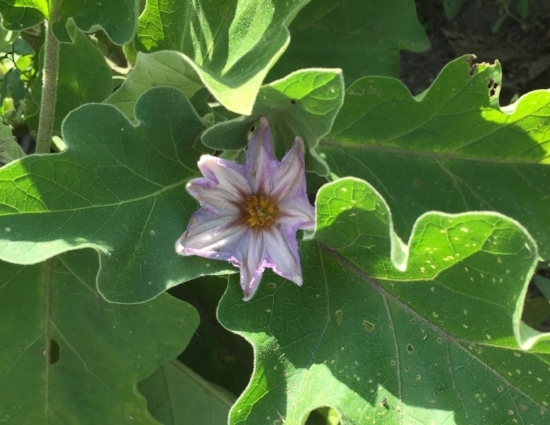 Eggplant (solanum melongena) is in season August through October. Eggplant is another beauty from the nightshade family and is actually a berry that is used as a vegetable. The flowers on the plants are just gorgeous, see below. Eggplant growing in my garden. 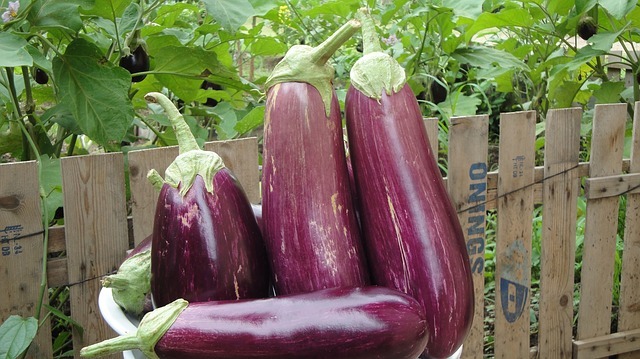 Eggplants can be found in a variety of colors. White, dark purple, light purple, brownish purple, almost black, yellow, green, pink, and bicolored. Eggplant can be pickled, stewed, baked, fried, stir-fried, grilled, stuffed, and sautéed. Eggplant is featured in many world famous dishes. Many people think they have to peel eggplant but, peeling it removes many of the amazing nutritional benefits it contains. 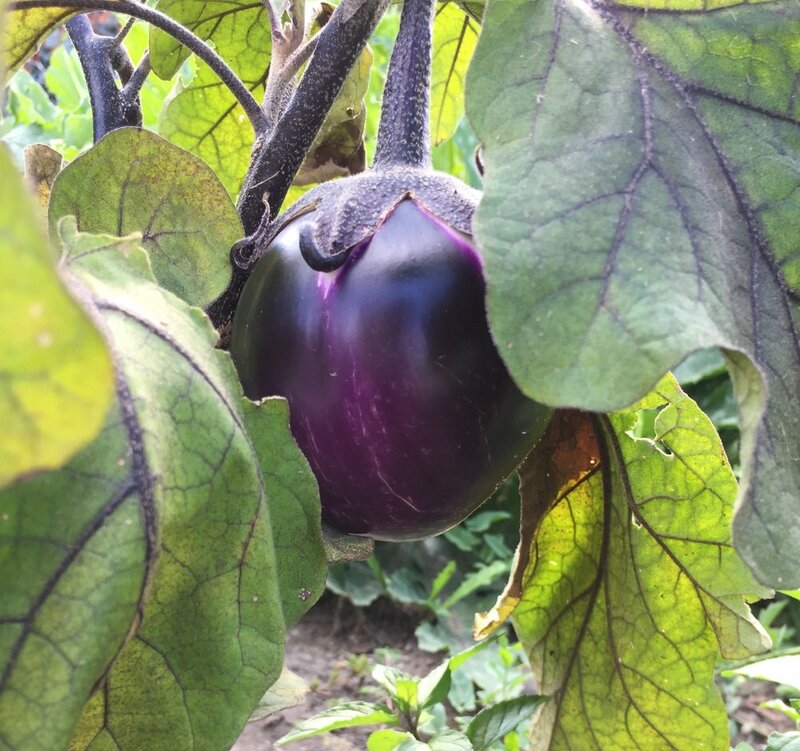 The skins are edible but, it is said that the younger, smaller, more tender eggplant skin is not as tough as the skin of the older and bigger eggplants. Some people actually prefer raw eggplant in salads because, they feel it has a milder flavor over cooked eggplant. Eggplant growing in my garden today! I grow eggplant each year and make an awesome lasagna bake by using unpeeled eggplant slices as the noodles. After much experimenting, I found slicing them thin, spraying both sides with a little bit of olive oil, and broiling them until lightly browned produced the best taste and consistency for the eggplant noodles. I’ve never had any complaints about the skin being left on, only rave reviews. Eggplant is a low calorie, high fiber food that has so much to offer! It is a great source of fiber and manganese. A good source of potassium, folate, and vitamin K and, it even gives you a bit of vitamin C, magnesium, copper, niacin and more. Eggplant contains the phenolic compounds Caffeic and Chlorogenic acid, which provide protection from oxidative stress and some bacterial and fungal infections. Some of the acids, such as Chlorogenic acid, does even more by consuming free radicals in the body before they damage cells. This action lowers the risk of some cancers, elevated LDL cholesterol, and some viruses. A reason not to peel this superstar vegetable is that the anthocyanin flavonoid, Nasunin, is responsible for the amazing blue, violet, and red colors in eggplant skin. Nasunin is responsible for removing free radicals and acting as an antioxidant to protect cells, help maintain healthy blood flow to the brain, and lowering the occurrence of damage to healthy brain cells. Let eggplant star in your next meal! Find a recipe to try and enjoy.